According to the Kew Royal Botanical Gardens in Surrey, England, the World Orchid Checklist contains more than 24,000 accepted species of orchid from around the world. Orchids in the dendrobium family take up a number of spots on that list and the varieties can exhibit different characteristics from each other. Some dendrobium orchids are evergreen, while others feature flowers that fade and fall from the plant each year. Regardless of the type of dendrobium you have, proper pruning is required to encourage healthy growth throughout the seasons. 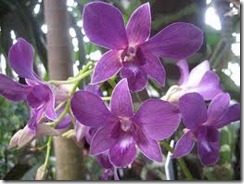 Prune the dendrobium orchid in late fall or early winter, after the blooming period. You will be able to see dead or dying branches more clearly and the plant will be able to retain more nutrients over the winter time without the extra plant material. Clean your pruning shears before pruning any plants and before moving on to another plant. This will prevent the spread of any contaminants or diseases between plants, even if you do not know they are there. Gently remove the orchid from its pot. Trim off any dead, damaged or unhealthy roots. Repot the plant in the same pot, with fresh soil; use a mix of 10 parts fir bark to one part orchid mix for pots that are smaller than 6 in. For larger pots, use medium-grade fir bark. Water the orchid until you see water draining out of the bottom of the pot. This heavy watering will encourage the roots to spread in the new soil. Cut away any dead or diseased branches or leaves from the orchid, to promote new healthy growth and prevent disease from spreading throughout the plant. 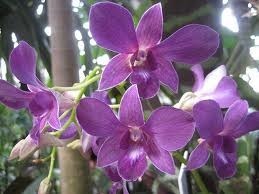 Prune orchids one inch from where the blossom stalk originates on the plant as soon as all of the flowers have died. The stalk will begin to turn yellow or brown, indicating that no new blossoms will form for this season. This close pruning will encourage new and healthy growth in the plant. Find fir bark and orchid mix at garden centers or nurseries.